Introduction to first-year physics, including advice for choosing the right subject, frequently asked questions and staff contact details. First-year physics subjects provide you with the opportunity to study nature at its most fundamental level, helping you understand many familiar and interesting questions about how the world works. You will learn about the structure and interactions of matter on all scales, from particles inside the atomic nucleus, through to human-sized objects, and up to the forces that give rise to the structure of the whole universe. An understanding of physics also underpins and complements many other areas of study, including engineering, chemistry, biological and environmental sciences. The School of Physics offers different pathways through first-year physics subjects to cater for students with a variety of backgrounds and with different needs and futures in mind. Subjects are available to students in all New Generation degrees. Any two-semester sequence of the following physics subjects, together with appropriate mathematics, will be sufficient prerequisite for second-year physics subjects. For students seeking a deep and more challenging introduction to physics. 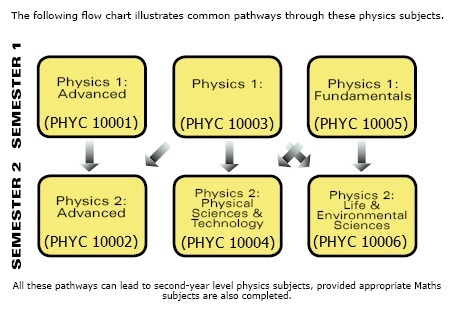 In general students who choose the advanced subject can expect to gain about the same mark for equivalent effort as they would if they had chosen Physics 1 (PHYC 10003). Background: ≥ 35 in both VCE Physics 3/4 and VCE Specialist Maths 3/4, or equivalent. For students who are considering taking physics beyond first year or as a complement to their other science or engineering studies. For students who have not completed Specialist Mathematics, or equivalent, concurrent enrolment in Calculus 1 (MAST 10005) is recommended but not required. Background: VCE Unit 3/4 Physics, normally with an unscaled score ≥ 30; VCE Unit 3/4 Maths Methods. Approximately two thirds of students have also completed Specialist Maths. An introductory subject that does not assume a previous physics background. Physics 1: Fundamentals uses calculus to a lesser extent than Physics 1. Background: Less strong in physics—no Year 12 Physics, or a VCE Unit 3/4 unscaled score ≤ 29. Follows on from Physics 1: Advanced and may be available to students who have an excellence performance in Physics 1. Students who have taken Physics 1 or Physics 1: Fundamentals in Semester 1 may choose either of these Physics 2 subjects. The same areas of physics study will be explored in both subjects. They will draw from examples across the spectrum of the sciences, but place greater emphasis on applications to particular areas of science. Students' choice will depend on the context in which they want to study Physics in Semester 2 and any other science or engineering study they are seeking to complement, i.e are they more interested in exploring physics in a subject that emphasises examples from the physical sciences, or would they prefer to study a subject that focuses on how physics principles can be applied in the life and environmental sciences. This subject is available only to students in the Bachelor of Biomedicine. It provides students with an understanding of the physics principles that underpin many biomedical processes and aspects of modern medical science and technology. Which Mathematics subjects should you take? If you are not planning to pursue physics studies in later years, there is no requirement to take mathematics subjects alongside your physics. However, since increasing your mathematical skills will support your physics studies it may still be a good idea to take mathematics subjects. Use the following contact details if you have any queries that have not been answered here. There is also lots of useful information to be found on the noticeboard outside the Physics Podium tutorial rooms.